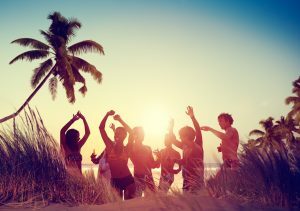 Many college students can’t wait to put down the books and let loose on spring break. But what many don’t anticipate (especially incoming freshmen) is the effort it takes to organize such a memorable experience. Here are 4 Helpful Tips for Planning Your Dream Spring Break Vacation! I’m sure you’ve heard of spring break locations college students typically like to go. Daytona Beach, FL or South Padre, TX might ring a bell! It’s important to brainstorm possible locations with your future travel companions. Once you’ve narrowed down a location, it’s time to confirm who will be attending. This could possibly be one of the most annoying aspects due to people’s tendency to “flake.” Make sure everyone is committed so you have an idea of costs and travel details. Only invite those you trust and won’t mind being around for several days. After you’ve found your posse you need to layout the trip details. Use websites like Kayak to compare flight prices if you prefer to fly rather than drive. For places to stay, use sites like Hotels.com or Airbnb and be sure to compare the places you located to the surrounding lodging in the area to make sure you’re getting a good deal. You’re almost there! Add up the prices and let your travel companions know what to expect. Don’t forget to add food and event money to the total. From my experience, you can expect to go over your budget a bit so be prepared! The earlier you book the cheaper the total will typically so make sure everyone is ready to pay!